One year ago today I sent my book baby out into the world. It's been a year full of highs and lows, but I feel so incredibly blessed to say I am living my dream of being a published author. It still amazes me that people are reading my work, talking about it, enjoying it, and anticipating my future novels. It's crazy and so, so wonderful. Thank you to everyone who has supported and encouraged me over the last year, and been part of this journey. You guys are awesome! 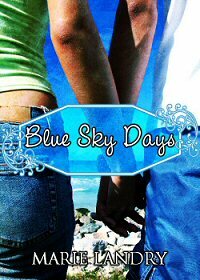 Today is the last day of my four days of giveaways, and since this is the actual anniversary of Blue Sky Days, I'm giving away two e-copies of the book. Be sure to enter my other giveaways! Don't have a Kindle but want to take advantage of the sale? You still can! Simply go to Smashwords and check out with the coupon code JZ94A and you can download the book for 99 cents in the format of your choice. A year after graduating from high school, nineteen-year-old Emma Ward feels lost. She has spent most of her life trying to please her frigid, miserable mother - studying hard, getting good grades, avoiding the whole teenage rebellion thing - and now she feels she has no identity beyond that. Because she spent so many years working hard and planning every moment of her life, she doesn't have any friends, has never had a boyfriend, and basically doesn't know who she is or what she really wants from life. Working two part-time jobs to save money for college hasn't helped her make decisions about her future, so she decides it's time for a change. She leaves home to live with her free-spirited, slightly eccentric Aunt Daisy in a small town that makes Emma feel like she's stepped back in time. When Emma meets Nicholas Shaw, everything changes - he's unlike anyone she's ever met before, the kind of guy she didn't even know existed in the 21st century. Carefree and spirited like Daisy, Nicholas teaches Emma to appreciate life, the beauty around her, and to just let go and live. Between Daisy and Nicholas, Emma feels like she belongs somewhere for the first time in her life, and realizes that you don't always need a plan - sometimes life steers you where you're meant to be. Life is wonderful, an endless string of blue sky days, until Nicholas is diagnosed with cancer, and life changes once again for Emma in ways she never thought possible. Now it's time for her to help Nicholas the way he's helped her. Emma will have to use her newfound strength, and discover along the way if love really is enough to get you through.